LAKE LOUISE, ALBERTA- Canada – Experience the rugged beauty of the Canadian Rockies on this spectacular horseback riding adventure at Lake Louise in Banff, Alberta. There’s no better way to experience Banff sightseeing than on the back of our beautiful horses. We offer you the best Horseback riding in the Canadian Rockies, an essential activity on any Banff National Park vacation! The Mountain Horse has been an important part in the exploration and enjoyment of the Canadian Rocky Mountains for more than 250 years. Legends in the Canadian Rockies, Banff’s Brewster family has helped the past stay alive. For six generations the family has been sharing the spectacular nature of the Rockies and its remarkable surroundings with visitors from all over the world. An extraordinary combination of nature and human history has created the glory that is Lake Louise – wild, beautiful, and unforgettable. In the world’s imagination, this is Canada. Through Brewster Lake Louise Stables, today’s visitors can relive the experience of the original visitors to Lake Louise. Whether a winter sleigh ride to the end of Lake Louise or a summer trail ride to a mountain guide teahouse, your Brewster adventure is sure to be unforgettable. Book Your Lake Louise Riding Tour Now! Our spectacular Lake Louise horseback riding tours are sure to be one of the best parts of your Canadian Rockies family vacation experience. Horseback riding is truly an essential Banff summer activity. 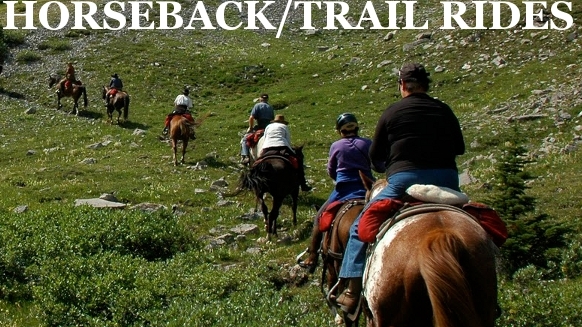 No Canadian Rockies vacation is complete without exploring the inspiring wilderness on horseback! Looking for more great summer activities in Banff? Be sure to check out rafting in Banff and the Kananaskis River! For great rafting in Alberta check out Alberta’s rafting site! Check out this awesome horseback riding videos from Brewster Adventures! Our experienced trail guides know the ins and outs of Lake Louise and Banff National Park. Your safety is always our number one priority. When participating in our riding adventures, always follow instructions carefully and treat animals with the utmost respect. This will ensure a safe, enjoyable experience for everyone.